Picture Brides Research Papers discuss a movie and a novel that describes the arranged marriages that Asian and Korean women experienced when emigrating from their homelands. Between 1908 and 1920 approximately 20,000 Asian women—Japanese, Okinawan and Korean—emigrated from their homelands to become “picture brides.” The term was loosely used to describe brides whose only contact with their husbands-to-be involved the exchange of a picture. Similar to the concept of arranged marriages, the process of becoming a picture bride differed in that Asian women were given a picture of their husbands-to-be and were given the option to decide for themselves if they wanted to remain in their home country or move to America. For many the decision as a difficult one, however, with economic conditions quickly deteriorating in Asia, many women believed that they would be able to secure “more appropriate” husbands if they moved to America. Picture Bride: a novel by Yoshiko Uchida and Picture Bride, the movie are two heart-felt tales of Japanese women who immigrated to the United States as picture brides during the early 20th century. Although the two stories are somewhat different, the tale that both women share reflects the atmosphere of how Japanese women were treated in the United States during this time. The women in both tales show the remarkable challenges that had to be overcome in order for picture brides to survive and flourish in a foreign land with strangers for husbands. On a personal level, perhaps one of the most difficult obstacles facing the women in both tales was the reality that, when they arrived in America, both were aghast to find that there husbands bore no resemblance to their photographs. In the film Riyo, is disheartened and repulsed by the fact that the man she is to marry, Matsuji, is fifteen years older than his picture. Unlike, Hana Omiya, the picture bride in Uchida’s novel, Riyo is not afraid to show her displeasure. Hana, on the other hand is shocked by her husband’s age and looks, but considerably more subdued about her reaction to her husband-to-be, Taro Takeda; “He was not a handsome man, but his eyes were kind”. One gets the feeling that this reaction was typical, as many women were not given accurate or age appropriate pictures of their husbands-to-be. 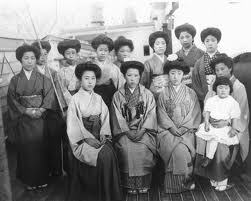 Adding to the problems faced by Japanese women who immigrated to America during this time period, was the anti-Japanese sentiment that pervaded the United States. During this time the United States had become embroiled in World War I and several years earlier Theodore Roosevelt had passed the Gentleman’s Agreement. Paper Masters writes custom research papers on Picture Brides a discuss and movie and a novel that describes the arranged marriages that Asian and Korean women experienced when emigrating from their homelands.